The event room can be reserved through the golf clubhouse at 706-557-3006 between the hours of 8:00 a.m.–5:00 p.m. 7 days a week. Cancellations must be made 30 days in advance. A $10 cancellation-handling fee will be applied. A forfeit of deposit if cancellation made inside 30 days of arrival. Accommodates 50. Tables and chairs are available for a flat rental fee of $50. 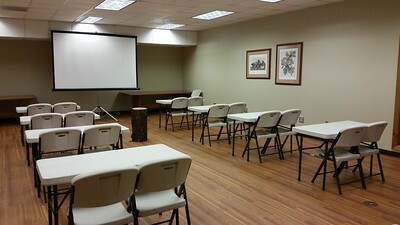 The event room can only be reserved by visiting the park office between the hours of 8:00 a.m.–5:00 p.m., 7 days a week. Call the park office at 770-389-7801 for additional information. Cancellations must be made 30 days in advance. A $10 cancellation-handling fee will be applied. A forfeit of deposit if cancellation made inside 30 days of arrival. The event room can only be reserved through the golf clubhouse at 706-283-6000 between the hours of 8:00 a.m.–5:00 p.m. 7 days a week. The event room can only be reserved through the park office at 770-732-5871 or 770-732-5873 between the hours of 8:00 a.m.–5:00 p.m. 7 days a week.